Nigeria's vice President Yemi Osinbajo says the problem with the country is finding honest people in positions of authority. Osinbajo said this on Friday in Enugu during a book presentation by former governor of Enugu state, Sullivan Chime. He said the widely-held belief that the problem of the country is ethnic-based is wrong and misplaced, adding that some leaders have instigated the division of the country along ethnic and tribal lines in order to sustain their empire. “The problem of our country is finding forthright men in positions of authority,” he said. Osinbajo described Chime as a man with strong values who made the desired change in the state during his time as governor. He called on political office holders to discharge their responsibilities with good conscience and responsibility, The Cable reports. Osinbajo said the country would be in a better place if politicians think of what the future would hold for their people rather than how to win their next election. 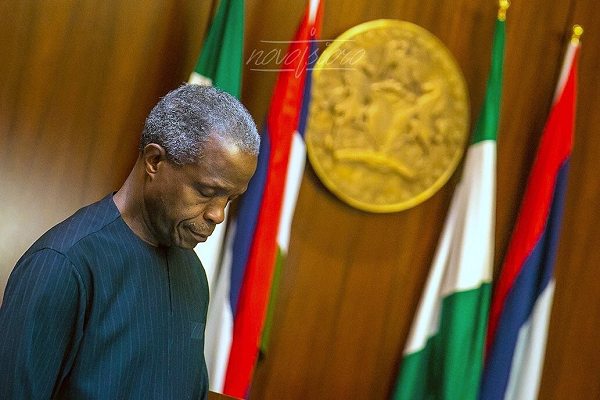 “At the end of the day, integrity pays and I congratulate Chime for the successes he recorded during his time as governor,” Osinbajo said.